The DP41-W series are discontinued. Please see the new DP400S strain and weight meter as a possible upgrade or alternative or contact our Customer Engineering department for details. The DP41-W is a highly accurate, stable weigh meter with a NEMA-4, splash-proof key pad. 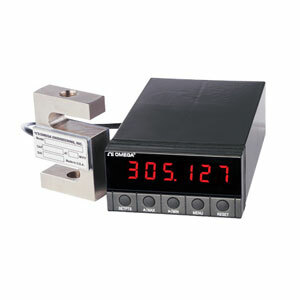 The meter has adjustable filtering for achieving rock solid readings in critical applications. This powerful meter is all self-contained in a traditional 1 /8 DIN case design, and can be used as either a weigh meter, a normal two point scalable meter or a 5 point scalable meter. The 5 point scalable option lends itself to varying cross sections on liquid level tank measurements, for improving nonlinear sensor characteristics and a host of other applications. All of the DP41-W’s options are field installable.